Antifascists in Charlottesville, August 12. via It's Going Down. This text is dedicated to the memory of Heather Heyer, who was murdered by fascists in Charlottesville on Saturday as she took a stand against racism. Not because her death was an unusual tragedy. As Heather knew, such tragedies are, unfortunately, all too common. Every day, every minute, a life is taken by the violence of hatred and oppression. Every day a black youth is killed by racist police, an immigrant mother is torn from her children by ICE, and an impoverished young opioid addict dies at home without healthcare. These tragedies are ordinary. But today we remember Heather Heyer because she knew they were not necessary. As a matter of logic, of following a basic premise to its conclusions, she showed up to confront the gathering of white supremacists in Charlottesville. She knew there was no choice but to refuse to allow them to take a single step further. For this basic, unimpeachable, unquestionable conviction, she was murdered by a fascist terrorist. At a certain moment, when faced with public events, we know that we must refuse. Refusal is absolute, categorical. It does not discuss or voice its reasons. This is how it remains silent and solitary, even when it affirms itself, as it should, in broad daylight. Those who refuse and who are bound by the force of refusal know that they are not yet together. The time of common affirmation is precisely what has been taken away from them. What they are left with is the irreducible refusal, the friendship of this sure, unshakable, rigorous No that unites them and determines their solidarity. This friendship brings us together, past the boundaries of death. Our refusal is one that no car, bullet, or noose can suppress. It is a No that rings out clearly and pierces the ears. The most craven and offensive disrespect to her memory would be to suppress and ignore the ideals that brought her there. We have learned of her longstanding commitment to overcoming racism and economic inequality. Her Facebook profile shows that she believed this commitment was expressed in the Bernie Sanders campaign and initiatives against Islamophobia. Centrist liberal pundits have spent the past year claiming that the so-called “Bernie Bros” were a homogeneous mass, nothing more than white men who ignored issues of race. The very label erased the many people of color and women, like Heather, who saw the necessity of pushing mainstream American politics toward the better world that so many revolutionaries have fought for. But on Saturday this left-punching slur was exposed as a self-serving and disgraceful lie, as members of the Democratic Socialists of America, the Industrial Workers of the World, the International Socialist Organization, and other radical groups put their bodies on the line to oppose racism, many of them ending up hospitalized by fascist terror. It all falls into place. I see the whole thing much clearer now, how fascism has taken possession of this country, the interlocking dictatorship from county level on up to the Grand Dragon in Washington, D.C. So it is no surprise that it was the Black Lives Matter Movement which brought the risk of a rising American fascism to public attention, and this movement was a vanguard that showed socialist organizations the path that had to be followed. In this way socialists discovered their own history, a history of resolute commitment to the struggle against white supremacy in the United States, reflected in the anti-lynching campaigns of the Communist Party, the black socialists and labor organizers who formed a large part of the leadership of the civil rights movement, and the Marxist-Leninist organizations that emerged from Black Power. Today we must remember not only Heather, but all those who, compelled by logic, left their homes in the morning to fight for justice, knowing that they might not come back. These people are never angels or saints. They are ordinary people, like you and me. And what must move us about them is that for every fallen comrade, a thousand more stood up to take her place. Their refusal could not be silenced. They knew that the way to honor the victims of injustice was to eradicate it. Such tragedies undermine the handwringing that often accompanies actions to confront the extreme right. The mainstream discourse presents “antifa” as a violent mob, only the mirror image of the right — a dangerous, collaborationist fallacy. But even on the left, too many claim that such actions only bring more attention to a small and insignificant group of lunatics — as they did when Berkeley students successfully stopped a fascist gathering. They claim that such actions are a distraction from the kinds of policy changes that need to be pushed for by more modest means. Fortunately, the rapidly growing left organizations that make up our contemporary activist landscape did not listen. They knew, perhaps instinctively, what their political responsibility was. And there should be no question now that when oppressed people are under attack, socialists will be there to put their bodies on the line. We should be grateful to those who do, because the handwringers are taking a dangerous risk. As late as 1932, historian of the Third Reich Ian Kershaw points out, “underestimation of Hitler was commonplace” among British journalists. The past year has shown that it is foolish to predict our political future; instead, we must act to shape it. The principal virtue that we need is courage. This is not always the case: in other circumstances, other virtues may have priority. For instance, during the revolutionary war in China, Mao promoted patience as the cardinal virtue. But today, it is undeniably courage. Courage is the virtue that manifests itself, without regard for the laws of the world, by the endurance of the impossible. This is the courage which allows us to confront the fascists, but also which keeps us from being disheartened by the naysayers and handwringers. The centrist liberals who admonish us not to politicize a tragedy must ultimately be categorized as collaborators with fascism. To undermine efforts at self-defense, the continued struggle to drive Nazis out of one’s home, the resolute insistence on carrying forward a project for structural change, is to enable the growth and power of the extreme right. We cannot allow ourselves to be intimidated by those who dishonestly smear the activists thanklessly working through the night to canvass and organize. Of course, this does not mean the kind of intransigence that would prevent fronts and coalitions. We have already formed coalitions. 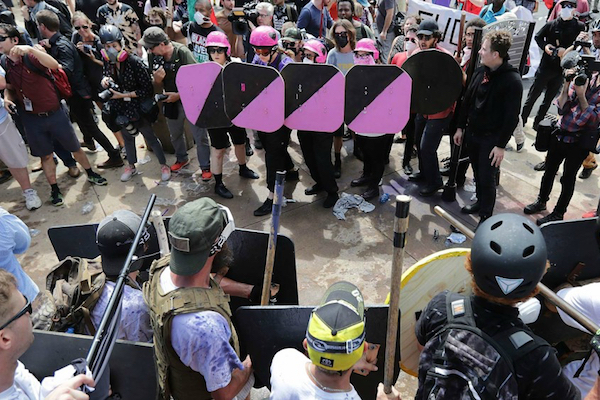 A kind of alphabet soup showed itself capable of overcoming sectarianism in Charlottesville to fight a common struggle: BLM, DSA, ISO, IWW, RCP, WWP, MACC, and so on. Anti-racists, feminists, unionists, socialists, anarchists, and the many militants who are all of them at once, can build a powerful front. We can learn to talk to each other, not to have the same language, but to make new languages by working together. There is no reason in principle to exclude liberals from an anti-fascist united front. But in practice, the centrist bystanders undermine this struggle at every opportunity. They must be prepared to firmly reject collaborationism and choose a side. They must be willing to accept that socialists will not compromise their politics for the sake of respectability, an absurd notion when a fascist buffoon sits in the White House. Anyone who joins an anti-fascist coalition must be capable of recognizing that socialists are committed to fighting racism, and they need material support. They put their bodies on the line, have made incredible sacrifices, and insulting them is obscene. Anyone who joins an anti-fascist coalition must be prepared to acknowledge that when armed Nazis come to town, a young person wearing a bandana and wielding a baseball bat is not “inciting violence.” Tactics can be debated respectfully, but undermining the safety of comrades is irresponsible. The uniting principle of the anti-fascist front is this: every time fascists announce an event, that event gets cancelled. Nazis should be afraid to appear in public. Either you help make that happen, or you're a collaborator. To be sure, this kind of power cannot be built solely with rallies and counter-protests, though those are essential. They must coexist with a sustained organizational process. It means that a revolutionary movement must insinuate itself into our culture and social fabric. And this must mean the construction of an unshakeable anti-capitalist tendency, because it is impossible to confront fascism without confronting the capitalist system which spawns it. We must bring our organizations directly into people’s lives, so they know that when they are abandoned by the state, when they are unable to access food and healthcare, when police attack them, when they are sexually harassed by their bosses, our movement is there. So we remember Heather, and every other comrade who had the courage to go to Charlottesville, because they showed a terrified nation that every time fascists attack, we will be there to say No. Asad Haider is a founding editor of Viewpoint Magazine and the author of Mistaken Identity, out with Verso Books next spring. He is also co-editing a collection of black revolutionary theory titled The Black Radical Tradition: A Reader.